An encoder is a device that takes linear or rotary movement and translates it into computer data. Also, many moving lights have encoders in them for generating position feedback information. These are usually in the form of optical encoders or rotary encoders usually attached directly to the motors for various functions. 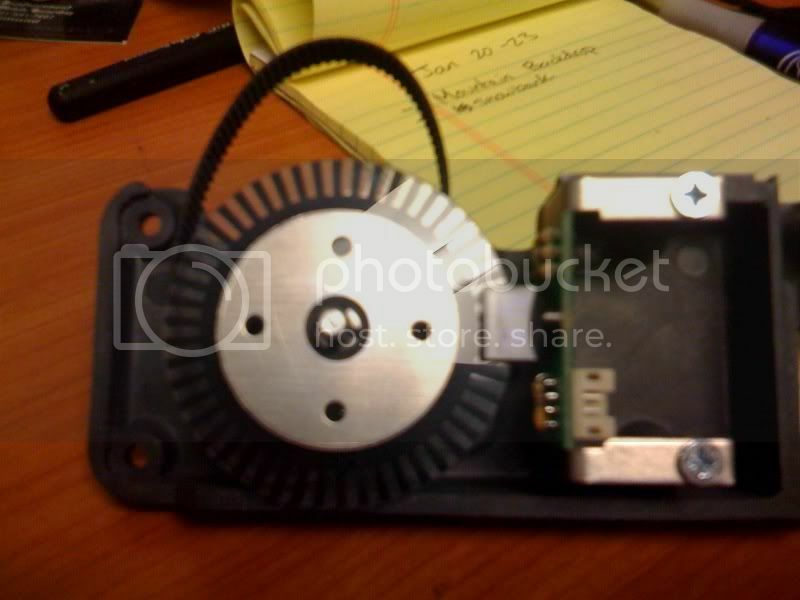 Below is a photo of the optical encoder from the scroller of an ETC Source Four Revolution. The belt you can see connects the encoder to the scroller's motor. Many automation systems utilize encoders to feed position and speed information to the controller. Often the encoders are attached directly to the shaft of the drive motor as it turns significantly more times thus giving a higher resolution in the data encoded. Sometimes it is necessary to know exactly where a piece of scenery is thus, mounting an encoder on the piece such that it can track movement across the floor or in the case of a revolve one might mount an encoder that tracks the edge of the revolve. Below is a photo of the Dynapar H20 series encoder, one of the recommended encoders for use with the Make it Move automation system by Creative Conners Inc.
One of the most common places to find linear encoders is on digital sound consoles. Faders on analog consoles were just potentiometers, but on digital consoles most faders are now encoders. The encoder tracks the position of the fader and tells the processor how to attenuate the signal. There are two main types of encoders, absolute and incremental. An absolute encoder always gives a reading relative to zero. The know where their zero point is, and can give readings in both the positive and negative directions. An incremental encoder does not keep track of it's zero point. The zero is usually determined by the software controlling it. All an incremental encoder can do is tell you how far it has moved since the last time it was moved. This page has been seen 1,802 times. An automated review of this page attempts to determine its readability in English (US). The page contains roughly 381 words across 29 sentences.